About 500 years ago when I was fresh off the boat from Australia and drunk on the novels of EM Forster, Thomas Hardy and Evelyn Waugh, I somehow imagined I would one day live in a fine Country House with lots of guest rooms and verdant grounds for striding forth on Bracing Walks. At the very least, I was sure I would befriend someone who knew someone who owned one. None of this has eventuated. Apart from the odd weekend away at a posh country house hotel (bills always steep, atmosphere invariably flat), the closest I have come to my rural idyll is Coombeshead Farm in Cornwall, where I stayed last weekend. Quite a lot has been written about Coombeshead since it opened last summer, but for those who haven’t sniffed it on the breeze yet, it’s a kind of rural retreat for the food-obsessed. The lovechild of Tom Adams (twenty-something chef-owner of London’s acclaimed BBQ joint Pittcue) and his business partner and pal April Bloomfield (renowned New York-based British chef), it offers accommodation in a picture-perfect 16th century farmhouse and feasts prepared by the owners (Bloomfield visits regularly) using the farm’s own produce and trusted hyperlocal suppliers. 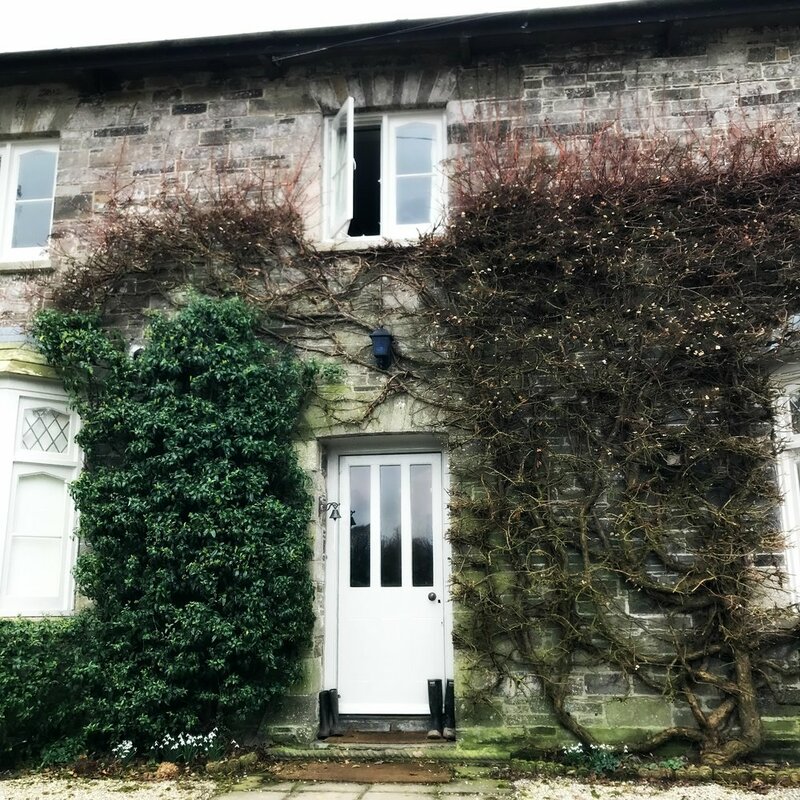 Coombeshead has all the hallmarks of a typical boutique hotel in the countryside: Wellies by the front door for guests to step into, crackling open fires and squishy sofas, elegantly understated bedrooms and photogenic chickens pecking around the central courtyard. Except this hotel – if that is in fact what you call it – is extraordinarily cool. Accommodation: the five lovely bedrooms are simply decorated, with comfy beds, crisp linen and dreamy views across the countryside. Some reviewers have remarked they're a little bit spendy at £175 per double per night (including breakfast), especially as the bathrooms are tiny (ours had no bath, just a shower). All I can say is I’ve paid a lot more for a lot less, and it's hard to begrudge the price when there so many generous touches: a bottle of sloe gin in the bedroom so you can help yourself as needs arise, an honesty bar downstairs, and a jaw-dropping breakfast (more of which later). As is the way with boutique hotels these days, there are no televisions or electricals in the bedrooms, save for the obligatory DAB radio. This is fine by me, except for the Coffee Problem, a common one among boutique hotels who fear the aesthetic will be spoiled by a kettle. The thing is, I need a brew before I'm fit to face strangers at breakfast, so with no room service or coffee-making kit in the room, what to do? The vibe: previous reviews have pointed out how casual it all is and it's true; staying at at Coombeshead is like visiting friends with an awesome home and exceptional hospitality skills. During our visit we nattered with/distracted Tom and his kitchen offsiders Blair and Henry , as they peeled and chopped and prepared their glorious sourdough bread. If you pop your head around the door to say you fancy a cuppa, Tom or his girlfriend Lottie will return with a lovely tea tray, maybe with rye and spelt shortbread (topped with a perfect sprinkling of salt crystals) or a wedge of quince frangipane tart, which you won't have room for but you'll eat anyway because it looks and tastes delicious. In the slivers of time between eating you can make yourself at home in the sitting room or the library, which has a covetable cook book collection. Or go for a walk; there are 60-odd acres of truly lovely meadows and woodland, complete with gurgling stream, to wander about in and work off some of the feasting. Dinner is served communally around one lovely big table and if the idea of this bothers you, really, you need to just get over it. Even people who claim to hate dinner parties need not fear; the evening starts with small bites and drinks in the sitting room - the exceptional cocktails include a wonderful dirty martini made with pickled wild garlic brine - so everyone has warmed up by the time they sit down for dinner. As the food comes out and the booze flows, the decibels rise and conviviality reigns. The food: on our visit, many of the guests had been lured to Coombeshead by a recent write-up in the Guardian praising breakfast; the reviewer had come away so bewitched they declared it the finest in all of the UK. Certainly Adams lays on a cracking morning spread: flavourful, grain-rich Burcher muesli, preserves and yoghurt, incredible sourdough toast and cultured butter, and the main event of thickly sliced belly bacon, hog’s pudding and a bowl of scrambled eggs the consistency of silken whipped cream. For us, though, the star meal was the three-course set dinner (£50pp plus booze), which showcases Adams' culinary imagination and skill, and sublime ingredients. He makes every tiny thing from scratch: from luscious fat-flecked charcuterie to glorious pickles (the shelves are stacked with jars of ferments, from dainty nasturtium capers to ribbons of wild garlic), and home-churned cultured butter to sour cream for the pudding. Food highlights for us included a heady bowl of smoked roe so good that no one really wanted to share it (meals are served family-style); slices of intensely flavoured, farmyard-ripe mutton ham served on a sharpish green sauce; and a rare-breed short rib rendered so obscenely sticky and tender after five hours in the AGA it was the texture of butter. To our surprise, the most stunning dish that BBQ meat maestro Adams served was a vegetable main course; he slow-roasted celeriac, an otherwise under-valued root veg, until burnished without and creamy within, and served it with a rich butter sauce, roasted pumpkin seeds and a swede reduction that swung a delicious umami punch. Adams says that vegetables will be his focus going forward, and if this dish is anything to go by, that's a fine decision. It also makes sense for the menu not to be completely meat-centric. Coombeshead is a fair old hike to get to unless you're coming from the West Country, and staying two nights is almost a necessity. As delicious as the meat dishes are, two nights in a row could be too much of a good thing, even for dedicated carnivores like me. Coombeshead is evolving. Building work is underway to create more bedrooms, a cookery school, a bakery and a second dining area for pop-up events. This is a very special place and I can't wait to see what Adams and Bloomfield get up to next - I'm going back.